As someone who’s long been into Spider-Man, the movies and various animated TV shows particularly, when I first saw the trailer for this film, I was really excited. Tobey Maguire/Sam Raimi’s trilogy ended on an extremely disappointing note for me five years ago, an experience that left me feeling cheated because it seemed that the makers had ruined everything it was possible for them to have ruined about Spider-Man. They jam-packed the movie with all sorts of villains for the friendly neighbourhood wall-crawler and it was all cliché upon cliché upon cliché. It seemed they had forgotten the high points of the first two films, had forgotten and/or discarded what had made those two so good. I was ready for something new when I first saw Andrew Garfield web-slinging in the trailer. My curiosity was immediately piqued and I wanted to know more. Looking back, it’s probably a good idea that I didn’t pick up the “Amazing Spider-Man” comics that I was told the film was going to be based on. When I first saw Maguire’s Spider-Man I pretty much knew how things would play out because I’d seen the Fox animated series several times by then and was intimately familiar with the story. With the reboot, I was prepared to be wowed. Going in without knowing who all the characters would be (or rather, their “Amazing Spider-Man” iterations) would be a good experience I thought. Good thing then that the film doesn’t disappoint at all. Garfield’s Spider-Man is, first and foremost, much more realistic than Maguire’s version. He brings emotional vulnerability to the role that the latter was almost always missing. It was much more realistic because Garfield’s Peter Parker/Spider-Man has a much better dialogue delivery. His quips feel like proper quips instead of just mere taunts because “OMG the script needs him to”. There’s a scene in Spider-Man 3 in which Peter cries when MJ tells him that she is breaking up with him. Watching Maguire play that out was like watching a baby cry when its toy is taken from him. It was also completely over-the-top. In The Amazing Spider-Man, emotional moments such as this, when Gwen (Stacy) and Peter are together and the scene is emphasising their chemistry, there is a relaxed, chill mood throughout. Garfield is also much more of a straight-talker than Maguire ever was, more nuanced in his portrayal with his vulnerabilities and strengths. Plus the fact that this is a slightly younger Peter Parker/Spider-Man and that he is much more emotionally grounded (getting to that in a bit in some detail). Hands down, Andrew Garfield wins out over Tobey Maguire. It’s not even a contest. The latter’s best performance was in Spider-Man 2, the one in which he fights Dr. Otto Octavius, and while that Peter Parker/Spider-Man comes close, The Amazing Spider-Man is just flat out better. He has a cooler costume for instance. Bit darker in palette. Much more stylized spider emblem. More of a mesh feel to it. I loved it. Emma Stone’s Gwen Stacy is not a character that I’m familiar with at all. I’m told that the character was also in Spider-Man 3 but for some reason I always thought that was Felicia Hardy. (Note: Bryce Dallas Howard, who played that Gwen Stacy, also happens to have played Victoria in Twilight, a thoroughly underperformed role). Straight up, I liked Stone’s Stacy far better as Peter/Spider-Man’s love interest than Kirsten Dunst’s Mary Jane Watson. Gwen is a tougher character all-around than MJ ever was (in terms of on-screen portrayal), and there isn’t the silliness in her character that Dunst brought to MJ. She is also much more grounded emotionally and she can match Peter/Spider-man quip-for-quip, as it was. Emma Stone has played the character brilliantly and together with Garfield, their chemistry really solidifies an already great movie. It’s also nice to see Peter with a love-interest that is NOT Mary Jane. I didn’t know this before, but it turns out that Gwen was Spider-Man’s original love interest and that MJ was only meant to be a rival, a supporting character, before certain circumstances happened and she replaces Gwen. Having seen various Spider-Man animated shows, it is also much more of a surprise because they all show MJ in that primary role. So it’s great that the film’s creative unit went for Gwen rather than MJ. It sets the new continuity apart from Sam Raimi’s version and makes it all that much fresher. The great acting in the film isn’t limited to just Garfield and Stone though. I really liked Rhys Ifans as Doctor Curt Connors/The Lizard. Very calculating portrayal of someone who happens to be both one of Spider-Man’s greatest allies and nemesis alike. Unlike the previous versions of him that I’ve seen, such as in the Fox animated series or in Spider-Man, Ifans’ Connors is more morally grey character. There is an underlying plot that implicates him in the disappearance of Peter’s parents several years ago (something that hints at a much larger plot than what we are presented with up-front) and seeing the character resolve that conflict of interests was nice to see. It isn’t developed a whole lot, but it is definitely provided as a hook for any sequels. The scenes in which Connors struggles with his missing right hand were also good, as were those in which he attempts to find a successful result for his research into cross-species genetics, something that Peter ends up helping him with (this goes back to the disappearance of Peter’s parents). One thing I didn’t like though is that The Lizard was never presented as much of a credible villain. Sure, his fight sequences with Spider-Man are very visual and exciting and entertaining, but the character itself was lacking. Part of it has to do with the humanised face, which I don’t think really does the character justice. The Lizard’s motivations for being the movie’s villain smack of laziness, as if the writers didn’t put much thought into this. That’s something I definitely hold against the film. Denis Leary as Captain Stacy, Gwen’s father, was also great. Calm, considerate, easy acting with a touch of derision and humour is just what the doctor ordered. This was definitely a good casting. The character being somewhat of a foil to Spider-Man was presented in a realistic manner, much better than if John Jonah Jameson had been thrown in. I’m glad they, the writers, didn’t go that route. Martin Sheen, as Ben Parker, doesn’t get much screen-time but he dominates the scenes he is in. I really liked this version of Uncle Ben and when that one inevitable scene comes, I was really hoping things would be different. I just couldn’t get enough of him! That one famous line, while it is not uttered in that same format, also rates a mention. That’s something the writers got right. They got Uncle Ben to say it without actually saying it. Sally Field as Aunt May was decent. Nothing great, as she doesn’t get much screen-time but her relationship with Peter, what little we see of it, was nice. While Uncle Ben dominates the first half as Peter’s moral compass, it’s Aunt May who does that in the second half, whenever she makes an appearance. I’d like her to return in the sequel of course. Overall, I thought the way the writers handled the plot was one of the strengths of the movie. They sprinkled a great amount of mysteries throughout, such as who Peter’s parents really were and why and how they disappeared; what really is wrong with Norman Osbourne that Curt Connors’ cross-species genetics research is vital to his continued existence; who the mysterious man at the end of the bonus clip is, the man known as “the man in the shadows” in the credits, and so on. Tons of possibilities that are perfect setups for the sequels. (Note: apparently the date for the sequel is set for mid-2014 and that producers are interested in a trilogy as well). The plot is also generally focused on the main storyline involving Peter Parker becoming Spider-Man and his fateful confrontation with The Lizard by the end of the movie. A lot of people have criticised the film for this, stating that the mysteries are mistakes and what not. What they fail to understand is that the writers have dropped a ton of bread-crumbs in the movie. They are telling the larger story with Spider-Man/The Lizard, but they are also giving you little hints and things to totally hook you in. If the movie had been lacking these mysteries, it would have been incomplete. It’s these mysteries that, in the end, drive the characters of Spider-Man/Peter Parker and The Lizard onward. Visually, this is one of the best films of the year, definitely up there with The Hunger Games and Avengers. Spider-Man’s web-slinging moments are very athletic and complicated in their execution, which makes them really fun to watch. It’s like he isn’t web-slinging as such, but is actually dancing through the air. How and why Peter Parker develops this agility is pretty much irrelevant. We can all blame it on that spider-bite. Speaking of which, The Amazing Spider-Man has a much better “bite-scene” than Spider-Man. No buts about it. The way it happens, and where it happens, all ties into the mysteries and it echoes Connors’ cross-species genetics research. Much more complete package for sure. The skyline of New York, Spider-Man web-slinging around the city, his fights with The Lizard atop Oscorp Tower and in the city sewers and everything else, is just perfect. A lot of effort has gone into the special effects department for this film, and barring The Lizard’s facial design, everything works. The pacing is also great. At 136 minutes, this is slightly on the longer side, but I think that as a reboot (and a fantastic one at that) the movie deserves that length. Webb and his writers need that space to redesign the new world they are creating and there is very little about it that doesn’t work. I can’t actually think of anything that doesn’t. 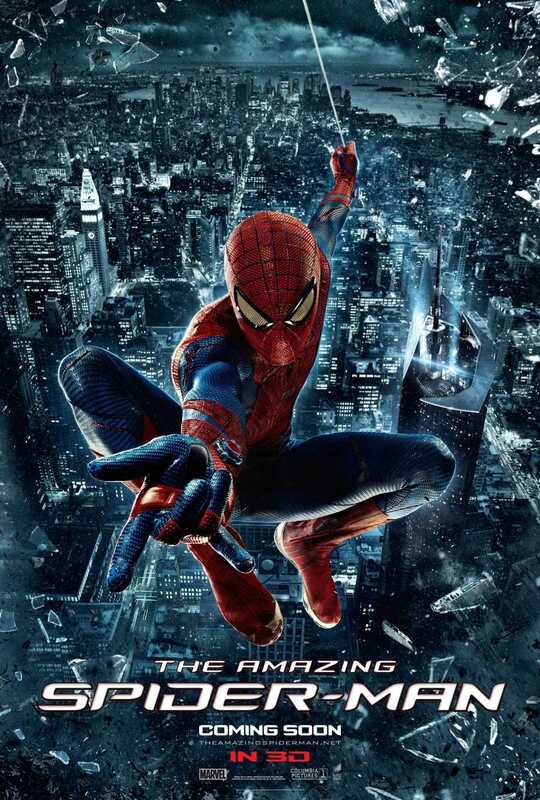 There are little similarities to the Sam Raimi trilogy and The Amazing Spider-Man is definitely a film apart. And just to add to that last line above, it’s the action that sets the film apart more than anything else, because this is a much more brutal film. Peter Parker/Spider-Man actually gets injured in the film. Those scenes, where we see how much of a physical chore being Spider-Man is for Peter, they serve to make the movie that much more realistic. And the 3D? In one word: fantastic. The visuals are that much more beautiful in 3D. I loved them. As is usual for me, I like to take off the glasses now and then to see how good the scene is in both 2D and 3D and the latter won out about 90% of the time. That’s a big positive in my book, considering that the 3D ticket prices are so high! The Amazing Spider-Man definitely deserved the 3D treatment. So overall, yeah. I loved the film. If you haven’t seen it yet, then you should most definitely see it. Posted on February 21, 2014, in Movie Reviews, Review Central and tagged Amazing Spider-Man, Andrew Garfield, Aunt May, Campbell Scott, Columbia Pictures, Comics, Comics Tie-In, Curt Connors, Denis Leary, Emma Stone, Film Review, Gwen Stacy, Irrfan Khan, Lizard, Marc Webb, Martin Sheen, Marvel, Marvel Comics, Movie Adaptation, Mutants, Oscorp, Peter Parker, Review, Review Central, Rhys Ifans, Sally Field, Spider-Man, Stan Lee, Steve Ditko, Superhero Movies, Superheroes, Supervillains, The Amazing Spider-Man, Uncle Ben. Bookmark the permalink. 1 Comment.